I recently discovered a cool trick with our washing machine (sadly to say it took me this long to discover it). My first washing machine was bought from a secondhand shop, oldish, and didn't have this function, which is probably why I hadn't figured this out until now. And when I say function, I'm talking about the ability to pump water from the bathtub into the washing machine. Considering that Japanese tubs, お風呂 (おふろ, ofuro - "o" being the honorific prefix), tend to be deep (but not long) and hold a significant amount of water, it would make sense to reuse all that water, right? Many washing machines (though not all), have functions to allow you to pump all the leftover (presumably still mostly clean) water into your washing machine for a load of laundry. If the idea of reusing that water for clothes grosses you out, keep in mind that the pump heads actually contain filters. Some models even contain activated charcoal filters, so you could practically drink the water, really (though these are much more expensive - and no, I wouldn't recommend drinking the water). My husband and I rarely use our tub, with the exception of an occasional soak; we find it a bit hard to justify using all that water and prefer shorter showers. Though once I realized we could pump water from the tub, I immediately thought I could use hot/warm water for the occasional load of laundry, such as towels or linens. Our washing machine, like many, only uses cold water to wash and rinse, which I don't mind most of the time but have wished at times for the capability of a hot water wash for certain items (I would imagine if you used cloth diapers for your child this may come in handy as well). So if you're like me, and would at least like the option of washing with warmer water, definitely check out your washing machine. *That isn't to say that you can't just go to a local laundromat (if the machines use hot water - some do and some don't from my experience), but I know I prefer to do as much laundry as possible at home without having to lug it around. Our machine came with an extra hose for pumping water, which we connect to a special valve at the back of the machine. The actual "pump" on ours is electronic and internal, and all we do is press a couple buttons, throw the pump end in the tub (with enough water for the chosen wash level), and let it do its thing. Some washers may have an external pump that is on the filter end of the hose. The easiest way to check if your washing machine is capable of pumping water itself is to just look for an extra hose valve on your machine (typically on the top, towards the back). If your machine came with a hose, it's quite likely there will be a valve somewhere. 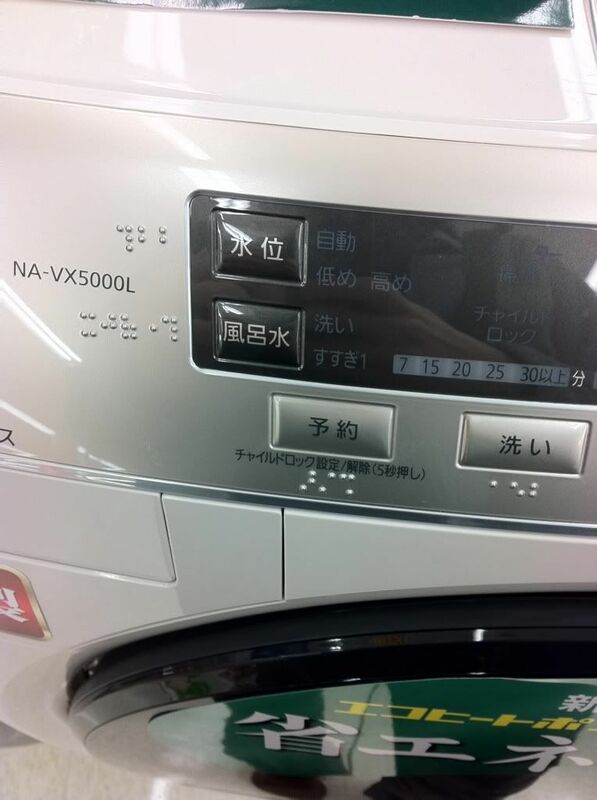 You can also look at your machine's manual, for something like "お風呂を使う." The buttons and descriptions towards the front of the machine may also indicate the machine has the ability to automatically pump water. Look for お風呂水 anywhere (the newer Panasonic models with this function all seem to have this written somewhere so it's possible older ones might as well) or お湯取, literally, "to take hot water." If you've checked out your washing machine and can't find any extra hose valves, or your machine didn't even come with an extra hose (if you bought it new), no worries! You can buy an incredibly cheap hose (給水ホース, きゅうすいホース, kyuusui hoosu OR バスポンプ用ホース, basu ponpu you [o sound] hoosu) and water pump (バスポンプ, basu ponpu) that you basically set up to fill the washer with water before you start it. I suppose you could always just carry water over with a bucket, but... not sure why you would want to if a handy dandy pump can do it for you. Then again, it would be a great arm workout. 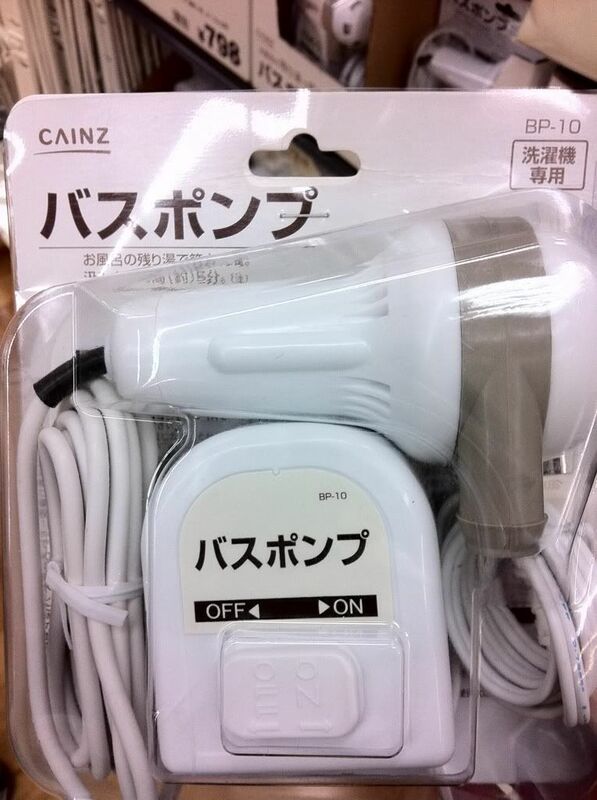 You can find water pumps and extra hoses almost anywhere - home stores, electronics stores, Amazon.jp, etc. You can buy them separately, or together in a pack, and the prices range anywhere from 500 yen a piece, separately, up to 8000 yen or more in a package, depending on what you want/need. *If your washing machine is located outside or nowhere near your bathtub, the hose probably won't be long enough to reach. *When using the external pump that you plug in, make sure you follow the instructions carefully so you don't get electrocuted. If you can't read them, try and find someone who can translate them for you so you are 100% sure of how to use that particular model. (Though what I've listed below is pretty standard). *Check your pump manual to see if there's a temperature limit at all. It's possible some might only be able to use water up to 45 degrees Celsius or so. 1. If your machine has the extra hose valve for pumping, attach the hose (properly, so it will work and won't leak all over the place). If you cannot attach the hose to your machine, then you'll want to follow the instructions of the external pump and hose you bought, though basically you'll drop one end in the washing machine (unless it has a faucet attachment some kind of stand to hook to the side of your machine) and the other end to the filter head of the pump. (You'll want to plug in the electronic base with the on/off switch as well). 2. Carry the end of the hose, with the pump, to the tub, and place in the water. Make sure the hose is stretched rather straight - you don't want any bends, curves, or kinks, as this makes it difficult to pump the water into the machine. After that, I shut the door and press "start." If you use an external pump, you'll probably need to fill the machine before you press start (as you'll need to close the lid, of course). I believe some or most pumps come with some kind of water level sensor, as well, but you'll have to check the pump you buy. For anyone out there who uses an "external" bath pumps, feel free to share your own experiences in the comments, as I have never used one.